This aircraft listing has been prepared to insure the remembrance of all those "faithful steeds" who served their aircrews so well when with the 380th Bombardment Group (Heavy), Fifth Bomber Command, 5th Air Force, Far East Air Forces, USAAF, during World War II. In this work the group will be represented by the terms 380th Bomb Group (H), 380 Bomb Group, 380th, or Group for brevity. The listing has been prepared under the auspices of the 380th Bomb Group Association, the organization of wartime veterans of service in the 380th Bomb Group and their families and associates. Australian veterans who served with or worked with the 380th are also welcomed as members of the Association. The basic unit of the United States Army Air Forces during World War II was the Group. Groups were built around the operational use of a specific type of airplane. In the case of the 380th, this was the B-24 Liberator Bomber. These planes were used in a particular class of mission suited to their capabilities. Again, in our case this was heavy bombardment associated with a large fraction of reconnaissance missions, particularly in the Australian phase of our service in the 5th Air Force as covered in this volume. The 380th was assigned to the South West Pacific War Area because of the long-range capabilities of the Liberator and the need for its services there at that point in the war (Spring 1943). 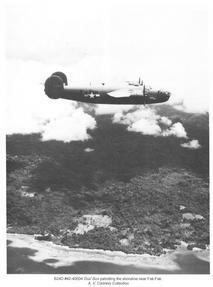 The 380th was initially assigned a unique mission, the strategic bombardment coverage of the whole of the Western half of the South West Pacific Area. This comprised the whole of the East Indies including Dutch New Guinea within range of our bombers. In other words, they were holding the left flank of the Allied effort in the South West Pacific Area during the 1943-44 period. When needed, the 380th joined their compatriot groups of the 5th Air Force in New Guinea for short periods such as during the several invasion campaigns that occurred there in 1943-44. To accomplish this mission, the Group was placed under the operational control of the Royal Australian Air Force based in the Northern Territory of Australia. As such they served the longest of any American unit under the direct operational control of an Allied Country. This service lasted from May 1943 to February 1945 when the Group again rejoined their American comrades in the Philippines as the war zone moved to that area of the Pacific. In preparation for that move, the 380th carried out another unique mission, that of training our Australian replacements to fly and fight the Liberator so they might take over the East Indian mission that the 380th was then leaving. This volume will cover all those aircraft that served with the 380th during the Australia/New Guinea phase of our service in WWII as noted just above. The succeeding volume will cover those aircraft involved in missions flown from The Philippines, including those aircraft that served in both areas. A total of 137 planes served in Australia and New Guinea. Of these, 53 served further in The Philippines. The authors regret any mistakes that may have crept into this compilation and we take full responsibility for such. We will welcome any comments or corrections from the readers of this book and the other parts of this compilation, and will make every effort to correct them. We will incorporate all corrections and additional data that we receive in this compilation on the Errata-2 page. Included in this and the succeeding volume is a series of descriptions of the various models of the B-24 Liberator bomber as its design advanced over the period of its use in WWII and as we used them. Sadly, the Liberator effectively disappeared at the end of the war, when most of them were destroyed to make way for the newer designs from the fast-developing aircraft industry. Click here to download all the text of Part V up to the Aircraft Types (in Adobe Reader PDF format). Click here to download all the text of Part V up to this point (in Adobe Reader PDF format).